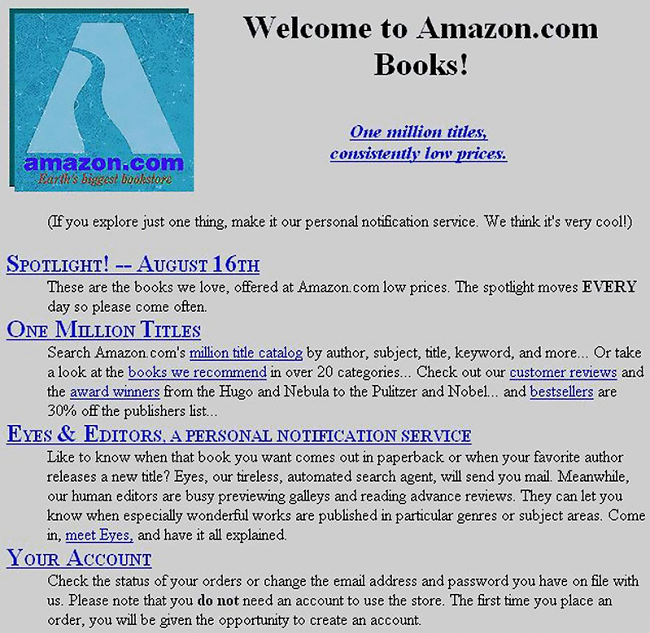 This is a screenshot of the Amazon.com website when it was just a month old, back in 1995. I want to point out a couple of things, one is obvious and the other is not. First, it’s pretty clear that web design has come a long way in the last 23 years. Second, hidden in the text is the announcement of Eyes, a “tireless, automated search agent that will send you mail” when it finds a book that it thinks you might find interesting. Eyes was the first time Amazon personalized online shopping. This was a step on a journey to reproduce the best service that is traditionally provided by local establishments who know their customers. We’ve all been lucky enough to get this type of service at some point, receiving an experience that’s felt tailored to our every need. Jump forward 23 years and, in many ways, the online experience now leads. You can log on to Amazon.com from anywhere in the world and receive a consistent experience built around your shopping habits, simply because the website knows who you are. This isn’t so easy in person. Walk into your favorite store, even in your home town, and the chances are you’ll be treated as just another anonymous customer. How can you change that? Imagine that you work for a clothing retailer. You could offer your customers great service if you knew who they were and sensibly used this information. You could suggest items to complement what they’ve already bought. You could not suggest items if you don’t have their size in stock. You could be sensitive to any issues or complaints the customer has previously made. You just need a shop assistant with a very good memory for faces. To quickly prototype the system, you’ll use a camera hosted on a Raspberry Pi to watch your store and stream video to AWS using Amazon Kinesis Video Streams. You’ll use Amazon Rekognition Video to analyze this stream, sending its output to a Kinesis Data Stream. An AWS Lambda function will read from this stream and emit messages to an AWS IoT Topic. In store, assistants will be given a tablet that’s subscribed to the AWS IoT Topic over a web sockets connection. The tablet can notify the assistant when a known customer enters the shop. The visibility of the tablet will help to make this experience feel more natural. Nobody wants to interact with a shop assistant who appears to magically know everything, but if it’s obvious where the help is coming from then customers will be much more likely to accept the technology. Including AWS IoT in your architecture enables you to further build out your smart store in the future. Instructions on how to install the Kinesis Video Streams C++ Producer SDK on a Raspberry Pi are in the AWS Documentation. At this stage, follow these through until the end of the section Download and Build the Kinesis Video Streams C++ Producer SDK. As part of the instructions, an IAM user with permissions to write to Kinesis Video Streams is created. If you move this project to production, perhaps with multiple cameras, it will be better to manage identity using Amazon Cognito. However, for now, an IAM user will do. Using the AWS Management Console, find and note down the Amazon Resource Name (ARN) of both the video stream and data stream. The first and second parameters sent to the sample app (-w 640 -h 480) determine the resolution of the video stream. The third parameter (my-stream) is the name of the Kinesis Video Stream you created earlier. If the above command fails with a library not found error, enter the following commands to verify the project has correctly linked to its open source libraries. After a few seconds, you can see pictures from your camera in the AWS Management Console for your Kinesis Video Stream. You’ve managed to get video from your Raspberry Pi camera into the Cloud! Now, you need to analyze it. The Rekognition Video service provides a stream processor that you can use to manage the analysis of data from a Kinesis Video Stream. The processor needs permissions to do this, so you go to the IAM console and choose to create a new IAM role. You select Rekognition as the service that will use the role and attach the AmazonRekognitionServiceRole managed policy. This role grants Rekognition the rights to read from any Kinesis Video Stream and write to any Kinesis Data Stream prefixed with AmazonRekognition. After the role has been created, note down the ARN. Amazon Rekognition doesn’t store the actual faces in the collection. Instead, it extracts features from the face and stores this information in a database. This information is used in subsequent operations such as searching a collection for a matching face. You set up an AWS Lambda function to process these JSON documents from the stream. Rekognition Video will tell you about all the faces it detects in your store, not just those that it identifies. You can use this information to further enhance the shopping experience in your store. How long do people spend in your store? How long do people spend looking at a particular display? How well do people flow from the store entrance to the displays further into the premises? The Rekognition Video output also tells you if any of the faces it finds match to those in the face collection. Your Lambda function uses this information to publish to topics in AWS IoT. Your shop assistants hold tablets that are subscribed to these topics. As soon as a known customer is detected in your store, the tablet can start to retrieve relevant information that the assistant can use to deliver great service. Delete the IAM user the Raspberry Pi uses for access. In the meantime, you can find out more about Amazon Kinesis or Amazon Rekognition by going to the AWS website. Nick Corbett works in Solution Prototyping and Development. He works with our customers to provide leadership on big data projects, helping them shorten their time to value when using AWS. In his spare time, he follows the Jürgen Klopp revolution.